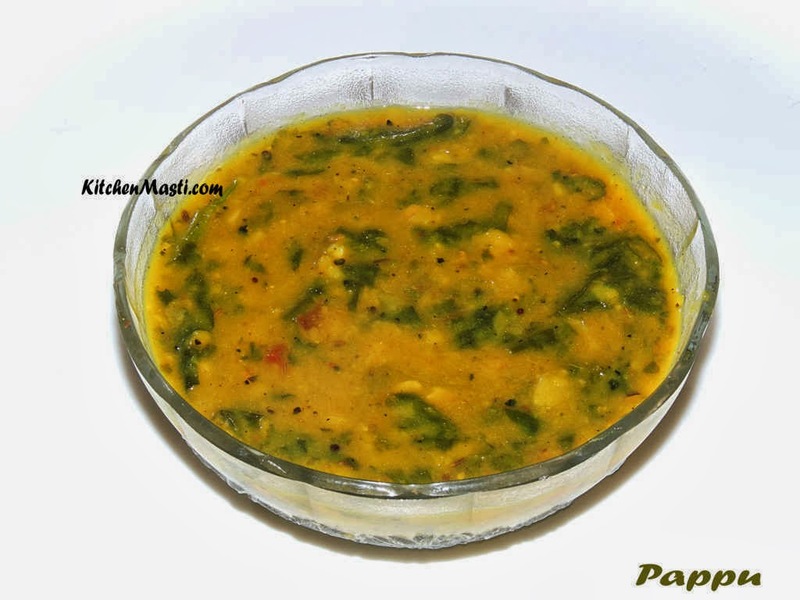 Pappu, a traditional dal which was originated in Andhra Pradesh is very famous now not only in Andhra Pradesh but recognised all over the globe as a tasty Indian curry. This is a very healthy and nutritious dal since it contains toor dal, one of the lentils which is very rich in protein that is very vital to our body. One more ingredient, spinach is also used in this dal. So the dal is enriched with the necessary iron and vitamins. In Andhra it is authentically prepared by adding more of pepper and garlic but if you wish it to be less spicier, then you can reduce the quantity of pepper. This dal requires around 20 minutes for the dal to boil and another 15 minutes for mixing the necessary spices. Toor dal ( pigeon peas ) - 1 cup. Spinach leaves ( palak ) - 1 big bunch. Slit Green chilli - 5. Jeera seeds ( cumin seeds ) - 1 tsp. Asafoetida - a small pitch. Turmeric powder - 2 tsp. Broken red chilli - 1. First and foremost, wash the dal and spinach leaves separately. Now in a pressure cooker boil dal, tomato, 4 mashed garlic cloves, 2 pepper corns, 1 /2 tsp jeera seeds and spinach leaves after adding 1 tsp of oil in it up till 5 whistles. Mash the dal and spinach leaves with the help of a ladle to a smooth consistency. Heat a vessel with 1 cup of water. Add chopped green chillies, turmeric powder and salt in it. After a few minutes, transfer the mashed dal ingredients into this boiling water. When the mixture starts to boil add asafoetida and lemon juice and switch off the flame. Heat another small pan with oil in it. Add broken red chilli, mustard seeds, jeera seeds, urad dal, chopped garlic cloves and curry leaves to it. When the seasoning ingredients starts to splutter, transfer the same into the vessel containing dal. Your tasty and healthy pappu is ready to be served.!!! You can mix in chopped onion while preparing the tadka. You can increase the amount of garlic if you intend to. The amount of pepper can also be added or reduced according to you wish. This dal curry tastes awesome with hot rice with ghee.